I asked on Twitter what folks might like to read next here on my blog and a couple people suggested I discuss the tools I use to build kits and other various stuff on my bench that helps me with that process. I thought that'd be a good topic so here it is! First off I have my set of Stanley screwdrivers. I use these a lot more than one would think but since they're all kinds of sizes including really small regular and philips drivers, I find myself using them to pry lots of stuff off of boards or shim something temporarily. A good set of small screwdrivers come in really handy on the bench. Next, my pliers. From left to right: a pair of cheap edge cutters, a wire stripper, and a Letherman. The edge cutters I think I just got at Radio Shack but a high quality pair with a very strong cutting edge is essential for kit builders. This pair has been worn quite a bit and the cutting edges are nicked up. I'm due for a new set. I'll skip the wire strippers for now and go to the Letherman. This one I got from my Dad ages ago probably when I was still in Boy Scouts. It's your typical multi-tool with all the fixings but I mostly use them for the needle nose pliers and for the straight edge knife. Of course a separate needle nose plier would be OK but I had this on hand so I use it. The knife gets all kinds of use from cutting rope to stripping coax. Again, this particular tool is getting a bit long in the tooth and deserves a retirement. Always keep in mind, a very sharp knife is safer than a dull one! As promised, to the wire strippers. I got this particular one at a garage sale in Indiana, but I think you can still find them at the hardware store. It is really great for chopping off coax in one cut (see the cutting edges below the head) and quickly stripping small hookup wire. It does not fare too well with stripping coax and when you get too small of wires in there, it just eats them up. It does, however save a ton of time so I use it when I can. Next up: needle files. I got this set at Harbor Freight for a few dollars and while they are typical Chinese junk, they will certainly get any job done in the shack that I need. I used them on my Firefly SDR case and they really helped make the finish look great. I had been holding out on getting a set but I think they will really change the way I do enclosures so they finally look nice. Of course, everybody needs a good soldering station. Mine is a Hakko FX-888. It is an a outstanding station and I highly, highly recommend it. For less than $100 US you can have a quick heating, variable temperature iron and the brand is well known. We use Hakko stuff in the factory at work so they're no slouch! This iron gets so hot you wont have any problems soldering PL-259s on anything. Also photographed is a bottle of water. This is for the sponge. There's some "professional" type bottle holders with the little straw thing that goes down and all you have to do is squeeze the bottle and all that but someone somewhere suggested once to just use a soda bottle and drill a small hole in the lid. So that is what I did and it works darn well. Again: if you don't have a soldering iron that has adjustable temperature control, get one of these Hakkos. You will NOT be sorry. And there's test equipment. The most used piece of equipment in this category is my Extech multimeter. My lovely wife got me this for our anniversary this year (the Hakko was last year's gift!). It is a great little meter and only $50 on Amazon. Here's some other miscellaneous stuff. Obviously you need solder. This is just some Radio Shack stuff which is fine but it is a bit too heavy for surface mount jobs. I need to get some thinner wire. Also pictured is a roll of Radio Shack desoldering braid for cleaning up those little accidents you have along the way. Ubiquitous electrical tape of course. And a "helping hands" style clip thing I also got at Harbor Freight for a couple bucks. The magnifying glass comes in handy when dealing with the surface mount stuff though I would love to have a stereo microscope someday. And finally, SAFETY. Well I guess they say "Safety First." A pair of DeWalt safety glasses. Honestly, I don't wear them all the time but I do try to remember to put them on when starting a project. Not only can solder or flux pop up and hit you in the eye but when cutting leads or wires or anything else, you are prone to have something fly into your eye. Definitely have a pair in your shack. Here's the whole bench. The bench was purchased from a guy at work and is a real industrial modular work bench. It is height adjustable and probably weighs about 200 lbs. Of course you don't need a fancy bench but it certainly does help to have something you can customize to fit your style and needs. So that pretty much covers all of the stuff I use the most. There's lots of other stuff I use too but much less frequently. What I have listed is really a good start for the budding kit builder. 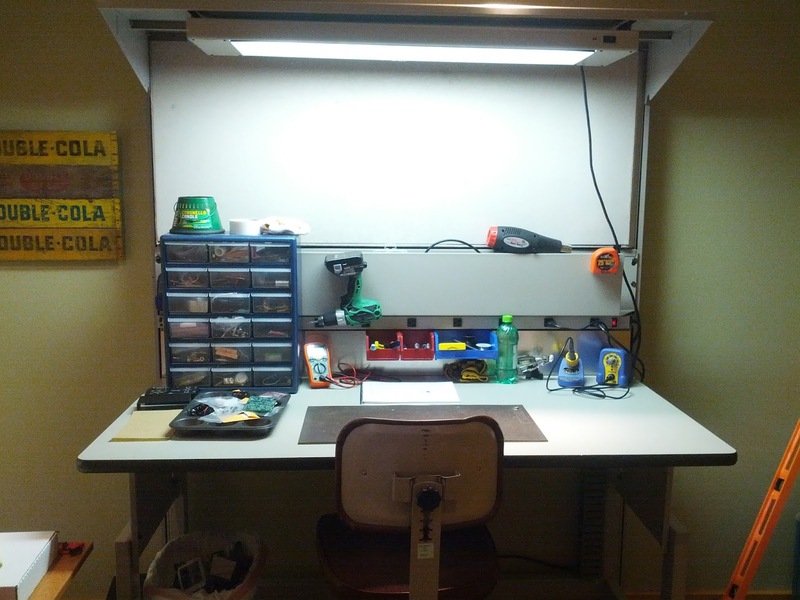 Just a few things to think about before you go outfit your new shack workbench. While there's plenty of things you can get really cheap, a few things you should focus your budget on are a good soldering iron and a multimeter. Those two things alone will make your building experience so much more successful and rewarding. Good luck, and to steal a line from one of my heros, see you in the soldersmoke! Good morning TJ, very nice run down of the equipment you have.